Sponsor, Tommy Anderson of Lagan Valley Steels is looking ahead with relish to the big occasion. ‘We are delighted to be able to continue to support the NCU T20 competitions and look forward to what promises to be an exciting finals day,” he said. In the semi-final of the Twenty20 Trophy Woodvale defeated Holywood by nine wickets, with undefeated half centuries from Mark Irwin and Farhan Saeed. Armagh overcame Bangor by 31 runs, with Neil Gelston turning in an all-round performance scoring 47 runs and taking two wickets. Waringstown captain Greg Thompson was in upbeat mood for several reasons. “The club is delighted to host these games; I have been on the ground this week, seeing the work, effort and time put in,” he said. 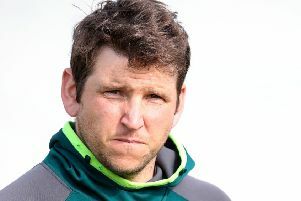 “I don’t get much time to watch other cricket, so I’m looking forward to Woodvale and Armagh, with the thought in my mind that we could be playing one of them next season in the Premier League. “In terms of our own game Waringstown North Down finals have always been keenly awaited here but for me it is the first time I will have played in one. “In reality, we are both the form horses of T20, North Down have peaked at the right time after a slow start. “You could say it was off the back of runs from Ally Shields and Ruhan Pretorius, but I would be reluctant to leave out the remainder of the side when looking ahead. “I believe in many ways they are suited to T20 and doubtless are a good team. I tend not to look too far ahead, we have tomorrow to concentrate on first and then I will worry about Sunday.